As always, we begin with two magic items – the first of which would be angry hornet, an enchanted blowgun dart: The dart, when fired at a target within 2 range-increments and misses, suddenly animates, trying to hit the target on the subsequent round, ignoring cover relative to the shooter – the dart buzzes around the victim, basically. The victim can try to outrun it or swat it out of the sky, though. The item takes winds and AoE-effects into account as well – flavorful and actually works, in spite of the complexity of the required rules-language – kudos! The festering angry hornet adds Con-damage and makes saving versus poisons harder, but otherwise works pretty much like the base hornet. As in all of these, we also receive an assortment of natural items: Glacier Toad Hide can keep consumables fresh and may protect from hot environments. (the spell reference here has not been properly italicized, though.) Leng Spider Eyes are a bit too strong for my taste: Adding one to a staff adds a second save to an existing one, Will, which causes temporary confusion…that should probably have a cap on how many times it can be thus used. Salamander tonic nets vulnerability to cold and fire resistance 10. Slurk grease can enhance grease spells as a power component and a brush made from tenebrous work’s bristles can really help increase the market price and beauty of paintings. Oh, and there would be ghost ale. 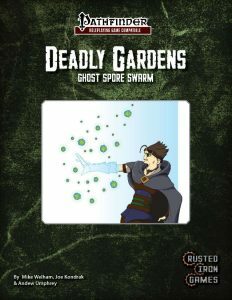 This draught is brewed from the spores of the eponymous creature and may make you incorporeal…but not necessarily lets you retain non ghost touch equipment. (Not italicized, btw.) Interesting if the wording on how not properly affected equipment works is a bit confusing at first reading: Weapons deal half damage to corporeal targets and armor only protects versus incorporeal foes – basically an inverse incorporeal. Interesting and warrants the complexity! Editing and formatting are good: While a noticed a couple of formatting hiccups, nothing too grievous. Rules-language-wise, the magic items impressed me this time around, so kudos there! Layout adheres to the series’ two-column full-color standard. The artwork is okay, but a bit cartoon-y for my tastes. The team of Mike Welham, Joe Kondrak and Andrew Umphrey provide another intriguing and well-crafted critter with some nice supplemental material. While I had a couple of minor complaints, none are grievous and for the more than fair price point, this is worth checking out. My final verdict will clock in at 4.5 stars, rounded down for the purpose of this platform.